Make your little one's eyes light up with joy when they see their very own My Life As 18&quot; Animal Rescuer Doll. Perfect for the child who loves animals, this toy features an adorable shirt with a pawprints and bones design, matching headband, lavender shoes, and one piece romper with a &quot;live, love, rescue&quot; message. The fully poseable doll has a soft torso, eyes that open and close and long hair that can be brushed and styled almost any way your child imagines. As part of the full collection of My Life As dolls, the My Life As 18&quot; Animal Rescuer Doll provides hours of playtime for any child and makes a wonderful Christmas, Hanukkah, holiday, or birthday present. Make your little one's eyes light up with joy when they see their very own My Life As 18" Animal Rescuer Doll. Perfect for the child who loves animals, this toy features an adorable shirt with a pawprints and bones design, matching headband, lavender shoes, and one piece romper with a "live, love, rescue" message. 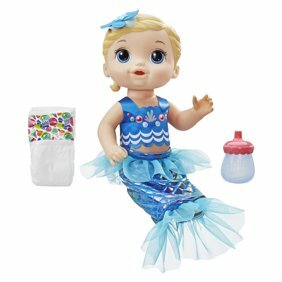 The fully poseable doll has a soft torso, eyes that open and close and long hair that can be brushed and styled almost any way your child imagines. As part of the full collection of My Life As dolls, the My Life As 18" Animal Rescuer Doll provides hours of playtime for any child and makes a wonderful Christmas, Hanukkah, holiday, or birthday present.